Quick! Who says "Ho ho ho!" No, not the guy in the red suit. I'm talking about the guy in green leaves. You know, the Green Giant. I was pretty excited to get to sample some brand-spanking-new Green Giant products. I mean, I grew up with the Giant in my mom's kitchen cupboards. I have to admit that I was enthralled by the commercials. Something about a huge green guy being the caretaker of vegetables really tickled my imagination. These days, the Jolly Green Giant is a little more modern than when I was a kid. Check out the videos here. I loved the Green Giant of my childhood, but I have to admit that he's even cooler now. Even as a kid, I loved vegetables. Pretty much all of them. Yeah, I was the weird kid who liked all the vegetables that no one else liked. So I was more than happy to take an offer from the jolly green fellow. Imagine my surprise when I found out that Green Giant is now making snack foods. And I had high hopes. The first bag I ripped open was multi-grain sweet potato chips with sea salt. The first thing I noticed was that these chips weren't overly salty. There was enough salt, but not so much that I felt like I was at a salt lick. I could taste the sweetness of the sweet potato an they were nicely crisp. They didn't last long, but I've got to say that they'd be great with a sandwich or with creamy dip. I was skeptical about the Roasted Veggie Tortilla Chips. I'm usually a purist about my tortilla chips, but one bite of these and I snagged the bag out of my husband's hands. Dang, but they were good. Tons of cheese flavor, and a nice corn flavor with other flavors in the background. Red and green peppers are pretty high on the ingredient list, and that's one of the things I thought I tasted. Most of the time, I use tortilla chips as a vehicle for guacamole, but I could be very happy with these chips on their own. Not that there's any evidence of that. Nope. None. Yup, it's a pretty amazing talent, right? Speaking of which, the Green Giant is unveiling surprise talent. Check it out here. For more information check out Green Giant's Facebook page. And if you want to show off your surprise talent, go right on over here. This drink reminds me of a lovely cocktail served onboard a cruise ship ... ah, I can remember the tropical breezes. And the sunburn. Ouch. That on-board cocktail was only served poolside, because that's where the ice cream drinks were made. Yup, it was almost a milkshake. Thick, rich ... and it required quite a few laps around the deck to work off. This one is much lighter since it's not made with ice cream, and the light iced coffee has fewer calories than the original version. Good deal, right? If you wanted to, you could make this a more adult beverage with the addition of some coffee or chocolate liqueur, and maybe even serve it in pretty cocktail glasses for an after-dinner treat. But as it is, it's a great morning smoothie or an afternoon refresher. Have you ever made a smoothie and wondered why you end up with chunks of ice, no matter how long you blend it? The trick to getting a smooth smoothie using ice cubes is to blend the ice cubes first, all alone - then add the liquid and other ingredients. If the ice comes to the party last, you're more likely to end up with bits and chunks of ice, rather than a smooth, thick drink. I thought this was perfect with the mocha-flavored iced coffee, but the vanilla would be just as nice. Place the ice cubes in your blender and blend until you have "snow." Add the banana and International Delights Iced Coffee and blend until the banana is obliterated and the mixture is smooth and frothy. Serve immediately. A straw would be appropriate. Little paper umbrella isn't required. With fewer calories and less sugar, International Delight Light Iced Coffee lets you enjoy MORE of what you love! For more fun ways to break up your day, visit ID's new online games today for a chance to win sweet prizes and coupons to use on your next purchase. 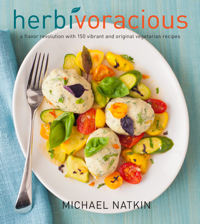 So, everyone seems to be talking about Herbivoracious by Michael Natkin, right? Okay, maybe it's just the people I hang out with, but I've heard a lot of buzz about the book. Must-have and all that stuff. Well, okay, I like vegetables. So here's me paging through the book, looking at all the beautiful recipes, and I get stuck on grilled cheese of all things. And it's not so much the recipe as it is a new technique that's got me all boggled. We all know that the best part of a grilled cheese sandwich is the warm, melty cheese, right? Hah! That's what you might say if you've eaten a grilled cheese sandwich but you've never cooked one. Because cooks know that the best part is the crusty browned bits of cheese that ooze out of the sandwich and get all crisp in the pan. Those browned bits NEVER make it to the serving plate because the cooks snag 'em and eat 'em. Because they're sort of odd almost-burned pieces, and who wants that, anyway, right? Yeah, right. Cooks steal 'em because they're the best part. So Michael Natkin decided to expand upon that browned-bit idea in a very ingenious way. His recipe calls for specific cheeses, which I'm sure are marvelous. But I didn't have them on hand, and I absolutely had to try this. With the cheese I happened to have. And YOU can try it with any grilled-cheese worthy cheese you happen to have on hand. I like colby cheese for grilled cheese sandwiches, but I've been known to stray. Use anything you like. Add stuff to the interior, like I did with my scrambled ham and egg grilled cheese, if you like. Or make it plain. But you have to try this. It's brilliant. Melt the butter in a nonstick pan on medium heat and place the slices of bread in the pan. Pile the cheese one one slice, reserving a small handful. Let's say 1/4 cup(ish). Flip the uncheesed slice of bread onto the cheesed side and press down. Cook on medium heat, flipping the sandwich as needed, until the bread is toasted and the cheese is melted. Now comes the genius part. Pile the reserved cheese next to the sandwich in a shape similar to that of your sandwich. Let it melt. When the edges begin to brown just a tiny bit, flip the sandwich over onto the cheese. The cheese will adhere to the sandwich. Oh yeah, now we're talking. Continue cooking until the cheese is nicely browned and crisp. In my house, soup is often inspired by what's in the refrigerator that I need to use up. Sometimes it starts with a stock, or sometimes it starts with the extra vegetables I bought. This time, it was inspired by my juicer. Do you juice? Do you hate throwing away the usable pulp? Me too. In this case, I had a whole bunch of carrot pulp left after juicing a LOT of carrots. I knew I could do something useful with that pulp. Or, really, it was more like shredded carrots. Sort of dry shredded carrots, but still good stuff - enough flavor left, plus the good fiber that would add body to my soup. If you don't have left over carrot pulp from a juicer, of course you can use shredded carrots. Or, heck, chop them if you like. Your soup will be more carrot-y, which isn't a bad thing. The ginger here was a late addition when I made the soup. After it was nearly done and I tasted it, I knew it needed a "warm" spice. I considered nutmeg, mace, cinnamon and cumin. All of those would have worked, but in the end I chose ginger. But I didn't want this to be a carrot-ginger soup. The ginger isn't particularly discernible, but it does add that warmth I was looking for. Like I said, I added it at the end, as an adjustment, but it makes more sense, recipe-wise, to add it earlier. The other thing this soup needed was a bit of acid, which is why I used the creme fraiche garnish. It's not just about pretty presentation. Sour cream would also work, if you don't have creme fraiche. But really, creme fraiche is easy to make at home. So go for it. Melt the butter in a stockpot or large, heavy-bottomed pot. Let it cook until the solids in the butter begin to brown, then quickly add the carrots and stir. Add the water, potatoes, celery, garlic, salt, thyme, and ginger. Cook at a simmer, stirring as needed, until the vegetables are very tender. Blend the soup with your stick blender (you could also do this in batches in a regular blender, but that wouldn't be a lot of fun.) The soup should be very smooth. If the carrots can still be seen in bits, continue cooking and blend again. It took about an hour before my carrots were completely smooth. Add the evaporated milk and blend once more. Taste for seasoning. Add salt, as needed. Serve hot, with a garnish of creme fraiche on each bowl. You can have more creme fraiche at the table, if you like, so people can add more as needed. *Check here for my creme fraiche recipe. This recipe is part of the weekly #SundaySupper, and this week it's all about soup. Go check out these awesome blogger and their soup recipes! Of course once you have seen all of the recipes for the day, you’ll not want to miss our #SundaySupper conversation on twitter each Sunday. We tweet throughout the day and share recipes from all over the world. This week we will be sharing out special soup recipes! Our weekly chat starts at 7 p.m. ET and you do not want to miss out on the fun. Follow the#SundaySupper hashtag and remember to include it in your tweets to join in the chat. I have to admit that Bob and I were never big breakfast eaters. Sometimes we'd go out for breakfast on a weekend, but at that point we were probably up for a couple hours. And someone else was doing the work. Otherwise, breakfast was a hit-or-miss affair. Coffee for sure. Then maybe toast or something simple. Maybe leftovers. Or cereal. Nothing very complicated. And sometimes nothing at all. But since he's come home from the hospital, we've had breakfast every day. Since he still can't eat a lot at a time, it's important for him to eat more often. Breakfast, lunch, dinner ... and snacks. And sometimes a late-night snack. But yawn ... I'm not all that perky in the morning. We've had French toast a few mornings, but anything more complicated than that needs to wait for lunch. I'm not going to be making crepes or flambeing things until I've stopped yawning and blinking and trying to make sense of the world. But ... but ... I'm getting tired of scrambled eggs. So I pulled out the waffle maker. After breakfast. After I was awake and functional. Because waffles can be made and reheated. Heck, they can even be frozen. I figured these would be ideal for the days when I wanted something really really easy. And let's be honest. Whipping up this batter is also easy. Particularly if you use self-rising flour. Measure the flour into a mixing bowl and set aside. Beat the mixture until it's well combined, then add this to the flour in the other bowl. (Note: baking wisdom tells you to add the wet to the dry and that's what I did. If you want to throw caution to the wind and add the dry to the wet, I'm not going to stop you.) Mix until everything is incorporated. It's fine if you have a few little lumps, but you don't want big blobs of dry flour in the middle of your waffles. Cook in your waffle maker according to the manufacturer's directions. Serve immediately or let them cool before storing or freezing. You can reheat in a toaster or microwave, whichever you prefer. We all know that more fiber is good for us, right? When it comes to baking, usually that fiber comes from whole wheat. But oats are a good alternative, and sometimes they're a better alternative. They're lighter in color in baked goods, and the flavor is milder, so they can be more appealing to people who haven't fully embraced the idea of whole grains. I made these muffins with a combination of dried blueberries and dried cherries - about 2/3 blueberries and 1/3 cherries - but you can use any proportion, or any dried fruit that you like. I've recently decided that I like dried fruits better than fresh in muffins. The flavor is more concentrated and they're sturdy, so you don't end up with squished fruit in the muffins. Some recipes call for hydrating dried fruits before baking. I might do something like that for a more delicate baked good, like a cake. But muffins are more robust, and they can handle the more dense fruit. Of course, if your dried fruit has been sitting around for a while and it is too chewy, you can certainly opt to hydrate the fruit before baking. These muffins were only tested at high altitude - if you're cooking at sea level, you might need an extra teaspoon of baking powder beyond what's provided from using self-rising flour. Up here (gasp, gasp) at about a mile high, these rose nicely, but didn't over-rise, which is always a worry. And the texture was perfect. Preheat the oven to 375 degrees and spray a muffin pan (with 12 regular-sized muffins, not the giant ones) with baking spray. Or, if you prefer, line with cupcake papers. Obliterate the oats in your food processor until you have a fine powder. It's fine if there are a few bits, but it should be mostly powder. Combine the obliterated oats, self-rising flour, salt, and dried fruit in a medium bowl. In a separate bowl whisk together the sugar, creme fraiche, oil, and egg. Add this mixture to the dry ingredients, and stir until it's combined. Portion the batter into the 12 muffin cups in the pan. If the oven hasn't quite come up to temperature at this point, no worries. Just wait for it. Bake at 375 degrees until the muffins are golden brown on top, they spring back when gently touched in the center, and a toothpick inserted into the center of a muffin comes out clean - about 18-20 minutes. Remove the pan from the oven and transfer the muffins to a rack to cool. *Home made creme fraiche is easy. Here's my method. The other day, I was straining some spaghetti and watched in horror as a good handful of noodles wriggled past the strainer and into the sink. Okay, the sink was clean enough, but most of 'em went down the drain, and there's no five-second-rule for that. Two days later, the Clip & Drain ($11.95) showed up. 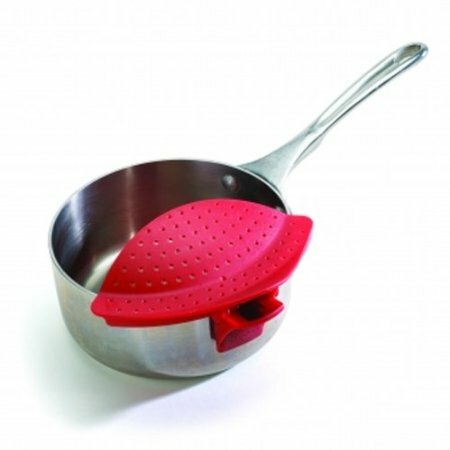 It's a simple idea - you clip it to the edge of your pot, and you have both hands free for pouring. The shape of the Clip & Drain makes it work with a huge variety of pot sizes, from small to pretty darned big. With pots on the far ends of the size spectrum, the fit wasn't quite as good as for the mid-sized pots, but it was good enough to keep my spaghetti from going down the drain. Although I like using this thing for draining potatoes, pasta, and vegetables, I found it even more useful when I was straining some stock. Maybe it's just me, but that usually ends up being a mess since it's the liquid that needs to be saved. With this, it was pretty easy to just strain the stock into a storage container and toss the remains that were left in the pot. I can't say how long the clip part of the Clip & Drain will last, but it seems pretty sturdy, and it grips the pots firmly. I was a little bit skittish the first few times I used it, thinking that if it slipped off, I'd lose a whole pot of vegetables, but it held firm. The curious thing about this product is that no one thought if it before. It's a genius idea, and it works really well. There are a lot of days when I need to put together a quick meal. Sure, I love the complicated recipes where I can spend the day peeling, chopping, stirring, tweaking ... but those are for days off. Most other days, I can afford some time in the kitchen to do put together something tasty. Maybe there aren't any fancy garnishes, but it's well thought-out and nicely presented. And then there are those days when I'm running like a maniac to get dinner on the table ten minutes ago. The simplest dinners are the breakfast-for-dinner meals, usually something like scrambled eggs and toast. That's sort of a last-resort, can't-think-of-anything-else meal. But it doesn't take much more effort to make this sandwich, and it's definitely more creative than simple scrambled eggs. Even better, it can be made in one pan, so cleanup is easy. Some pickles or chips or sliced tomato on the side would be great. Or, if you've got the extra two seconds, a simple green salad. My favorite cheeses for grilled cheese sandwiches are yellow cheeses somewhere in the continuum between American cheese and a non-aged cheddar. As much as I like cheddar cheese, it doesn't melt the way I like in a sandwich like this. Swiss or pepperjack would also work well. For the ham, this is the perfect use for left over baked ham, but you can also use deli ham, if you prefer. I like slightly thicker slices, but just about anything will work. As far as this new butter with canola oil, it's got a few advantages. It's soft and spreadable, it tastes good on its own (I was really surprised when I tried it on bread), and since there's oil with the butter, it has a higher smoke point than straight butter. It doesn't have any strange ingredients - it's just cream, canola oil, and salt. I've been using Land O'Lakes butter as my standard everyday for a long time, and I can remember my mother buying it, so obviously it's been around for a long time. Melt 1 tablespoon of butter in a nonstick pan on medium heat. Add the ham and cook, stirring, just until the ham warms slightly. Add the eggs on top of the ham, and break the yolks. Stir to combine whites and yolks and ham. Continue cooking until the eggs are cooked through. Transfer the scrambled ham and eggs to a plate or bowl and set aside for a moment. Wipe out the pan - you don't need to clean it completely - just get rid of the egg bits that might burn. Add the second tablespoon of butter to the pan. Place all four slices of bread in the pan. (If they don't all fit, you can do this one sandwich at a time.) Place a slice of cheese on each slice of bread. Place half of the egg mixture on each of two slices of bread, then top with the un-egged slice of bread and cheese. At this point, the cheese should be lightly adhering to the bread. Continue cooking, flipping the sandwiches as needed, until the bread is nicely toasted and the cheese is melted. The author was compensated by Land O’Lakes for this post. All opinions are my own. Hmmm. That title sounds like it should be the name of a boat. Remember the Secret Dipping Sauce recipe I published a while back? I used it to cook chicken then. Now, I used it to make fish, and it couldn't have been easier. The recipe for the secret dipping sauce is here. Heat the olive oil in a saute pan on medium heat and add the onion. Cook until the onion is softened, then add the secret dipping sauce an lower the heat to below a simmer. Cut the fish into bite-size pieces. Add to the saute pan. Cook, stirring as needed, until the fish is cooked through. Or, this would be a great filling for tacos. 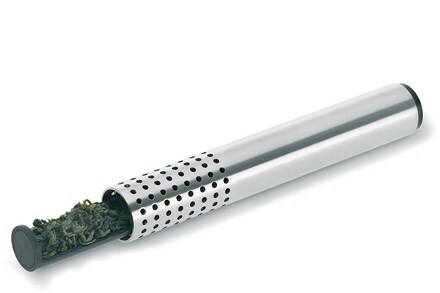 There must be a bazillion tea-infuser devices on the market, and among them is the Blomus Tea Stick ($20). The design is modern and the idea is good. You press a plunger, insert the end into your loose tea, and it should fill the tea stick's container. Release the plunger, and the tea is neatly contained. It works well if the loose tea you're using is the right size. Big leaves and chunks won't fit. When it comes to infusing, the tea stick is pretty tall, so it's fine if you drink your tea in a mug. If you're using a short, fat teacup, this isn't going to work so well. My pet peeve when brewing tea is that I don't want bits and pieces in my tea - I want a clear liquid without bits of leaves floating on top and gritty bits on the bottom. The tea stick doesn't spew bits the way my poorly-designed tea ball did, but small bits escape through the holes. I like the way this tea stick looks, but I'm less enthusiastic about the function. With some teas - the ones that had pieces just the right size - this worked perfectly. With other teas with larger or smaller bits, it was much less successful. First there were the chocolate covered oreos. I decided to melt the left over white and red chocolate together to get a pink coating. And then I rolled up some of the extra ganache I had left from the previous batch of truffles. I chilled the heck out of the truffles and then coated them with the pink chocolate. And then I sprinkled just a little bit of kosher salt on top. How cool would it be to cut into a loaf of bread on Valentine's Day and find a pretty pink heart? Yup, I thought it would be cool, and I wanted to do it without any food coloring. The heart idea was new, but I've been working on this general concept for quite some time. I've seen cakes with designs inside- hearts, squares, circles ... and I thought it would be pretty cool to do the same thing with bread. Of course you can put two different types of dough together. But it's awfully hard to get the dough to keep the shape you're looking for. It's hard enough to get it to behave when you're trying to make a bread sculpture like my bunny bread. But when you're trying to keep a shape or pattern inside the loaf, it's even harder. Here's one from a long time ago, where I was trying to make a smiley face. As you can see, it's didn't work very well. I've tried a few other things, but none of them looked good enough to blog about. I mean, think about it. You make a simple swirl bread and it never comes out as a perfect spiral. Stuff inside moves around a lot as the bread rises. And it's worse when you're using two different types of bread, like rye and white. They don't rise at the same rate. It's really hard to control what they're going to do inside the bread.. But then I thought, "why not put a baked shaped bread inside some dough?" that's how the cake makers do it. They embed cooked shapes in the batter, and they bake it. Sounds easy enough, right? It should work for bread, rights? Here was my first try. It's supposed to be a heart. It's not dead-center in the bread, but that doesn't bother me. That adds to its personality. The problem that you don't see is that the two different breads didn't join up very well. The heart falls out. Don't you just hate it when your heart falls out? I also wasn't thrilled with the shape of the bread insert. Unless you look really closely, you can't tell that it's supposed to be a heart. And then I also decided that I didn't like the color of that heart. I wanted more contrast. My second loaf looked wonderful coming out of the oven, but as soon as I cut into it, I could see that there was a huuuuge problem. Oops. I knew what I did wrong. But, see the heart shape? It looks a bit better here. That was an easy fix. I just cut the notch a little deeper so it looks more like a heart. This is what the shape looked like coming out of the mold I baked the bread in. See, it's a heart, but it could be a little more defined. It was a lot pinker before I baked it the second time inside the bread. The color faded. Bummer. But I had ideas for fixing that, too. Finally, after a number of tries (you don't want to know how many), I found a formula that worked. Combine the yeast, sugar, water, flour, beet powder, and salt in the bowl of your stand mixer. Knead with the dough hook until the dough becomes elastic. Add the butter (it's fine if you add it straight from the refrigerator - the machine can handle it) and continue kneading until the butter is completely incorporated and the dough is smooth, shiny, and elastic. Form the dough into a ball. Place it back in the bowl, cover the bowl with plastic wrap, and let it rise until doubled in size, about an hour. When the dough has doubled in size, remove it from the bowl and divide it in half. Form each half into a log that will fit into one of your canape bread molds. ** Or, if you're only making one loaf, you can use the second half of the dough for buns or a small loaf of bread. Coat the dough with baking spray or a light coating of oil before you place it in the canape mold. Place the dough in the mold, cover the ends, and let the dough sit until the dough has risen enough so it nearly fills the mold to the top. It's fine to open the mold to peek. It should take about 30 minutes. Place the filled mold(s) on a baking sheet and bake at 325 degree for 35 minutes, until the bread is baked though. It's normal for some of the dough to ooze out of the ends of the mold - don't worry about that. 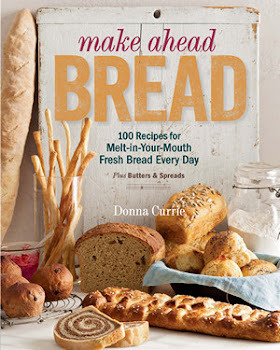 Remove the bread from the oven, take the ends off the mold, and cut off the excess that overflowed the mold. Slip the bread out of the mold and let it cool on a rack. If your bread mold is similar to mine, cut a v-shape in the notch of the heart to enhance the shape. Or, if you like it the way it is, leave it as-is. Slip the bread back into the mold and place it in the freezer for at least an hour. It's fine to continue the next day (or a few days later) if you prefer. Freezing accomplishes a few things, but one important thing is that it makes the bread hard enough so you can wrap the white dough around it firmly without squishing the design. Combine the yeast, sugar, water, flour, and salt in the bowl of your stand mixer. Knead with the dough hook until the dough becomes elastic. Add the butter (it's fine if you add it straight from the refrigerator - the machine can handle it) and continue kneading until the butter is completely incorporated and the dough is smooth, shiny, and elastic. When the dough has doubled in size, remove it from the bowl. If you're using a heart mold cut off one piece of dough that you can roll into a rope and fit into the notch in the heart. If you're making another shape (like the flower shape in the photo on the right) ), cut off enough pieces to fill any notches or valleys in the shape you're using. Knead the remaining large piece of dough briefly, then flatten it into a rectangle that will be large enough to wrap around the bread baked in the canape mold. The edges on the long side should be kept thicker to compensate for the point of the heart. For other shapes, the rectangle can be an even thickness. Remove the dough from the freezer and brush it all over with the egg white. Place the rope you rolled into the notch in the heart, then place the heart point-side up on the dough rectangle. Wrap the dough around the bread and seal the seam, making sure there's enough dough around the point. Flip the dough so the pointed end of the heart is at the bottom. Shape the dough into an even log-shape. Spray a 9x5 loaf pan with baking spray and place the dough in the pan, seam-side down. Cover with plastic wrap and let it rise until the dough rises about an inch over the top of the pan. Since you've cooled the dough with that chilly bread in the center, this will take longer than normal - 90 minutes or more. The dough should feel puffy and if pressed with a fingertip, it shouldn't spring back. About 30 minutes before the dough is fully risen, preheat the oven to 325 degrees. When the dough has risen, remove the plastic wrap, slash the top of the loaf, and bake until the loaf is nicely browned, about 45 minutes. Remove the loaf from the pan. If the sides an bottom are still paler than you like, place the loaf directly on the oven rack and bake an additional 10 minutes. Let the loaf cool completely on a rack before slicing. *The beet powder I used came from Whole Foods. You can probably find it online or at a store that sells bulk spices. If you like, you could use food coloring, instead. **These are the canape molds I have. If you don't have molds, you could bake a regular loaf and carve it into your preferred shape.